You just can't make a good movie without good villains. Imagine trying to film the movie's climactic fight without someone to fight. Or imagine if the film's hero had just taken a whole hour and a half to never grow or have to fight against an antagonist. Most. Boring. Movie. Ever. That's why, even though Cobra Kai were kind of a bunch of jerks to Daniel in Karate Kid, their existence was necessary. 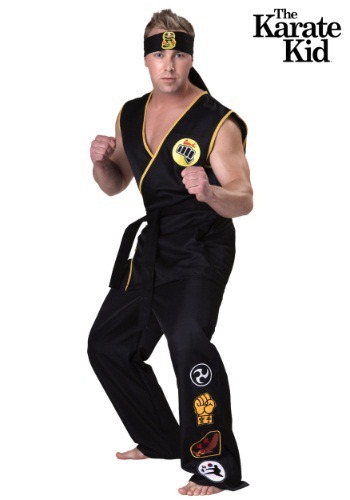 It would be totally boring to sweep the leg of someone who wasn't trying to pick a fight. It would be an absolute snorefest to see someone just shake hands at the end and say "thanks pal, we'll always be friends and never fight," while the credits roll. This one is officially licensed and exclusive, you won't find it anywhere else. It's 100% polyester poplin fabric. The tunic shirt has a self-fabric waist tie, gold edging, and an embroidered Cobra Kai logo. The pants have an elastic waist with 4 embroidered patches on the left leg. The twill belt is 2 inches wide, and the headband is 2 inches wide with an embroidered patch in the center.